A quick tot up of the numbers so far includes 35 individual classes, that’s around 1,050 students, with at least another 4 classes, 120 pupils, booked in before the end of term. This doesn’t include the staff team from Bevington School who came to learn about bee keeping as part of the project to install a hive on the school grounds, the Rainbows and Brownies who have been to visit and the various Family Courses that we’ve run throughout the year. Not all schools can consider having their own bee hives on site, although we have noticed an increased interest this year, but exploring the life of these fascinating mini beasts is part of the National Curriculum and how better to understand their life cycle and habitats than by inviting a bee keeper into the classroom! John Chilton, a local Special Education School asked us to visit during British Science Week and St Mary’s Norwood Green invited us to work with their youngest children. As well as visiting schools to talk bees, we have been delighted to welcome L’Ecole Internationale Franco-Anglaise to Hen Corner to meet the colonies that we have here. On to our feathered friends, we’ve had lots of fun introducing chickens to schools, and a community centre, this year. Both St Judes Primary and Streatham Wells Primary asked for our help in training every pupil and their staff in keeping chickens, ensuring that their own school chickens stay safe from predators and well fed and cared for. Whilst we keep our chickens and bees especially for the lovely eggs and honey that they give us, we have also been working with schools to support their curriculum in both more specific and broader food sessions. Back in October, we worked with every pupil at Floreat Brentford to help them make their own organic loaf of bread each as part of their Harvest Festival and we were delighted to go back to Elthorne Park High School to teach their GCSE Food & Nutrition students how to make cheese. Coming up, we are looking forward to three sessions of ‘Where does my food come from?’ for Smallberry Green & St Paul’s Primary and have capacity for three more school visits before the end of term if you are interested in us working with your local school. As well as our schools work, we’ve had children visit with their grown ups to bake, learn about chicken keeping and discover our honey bees. You can find details on all our Family Courses here. 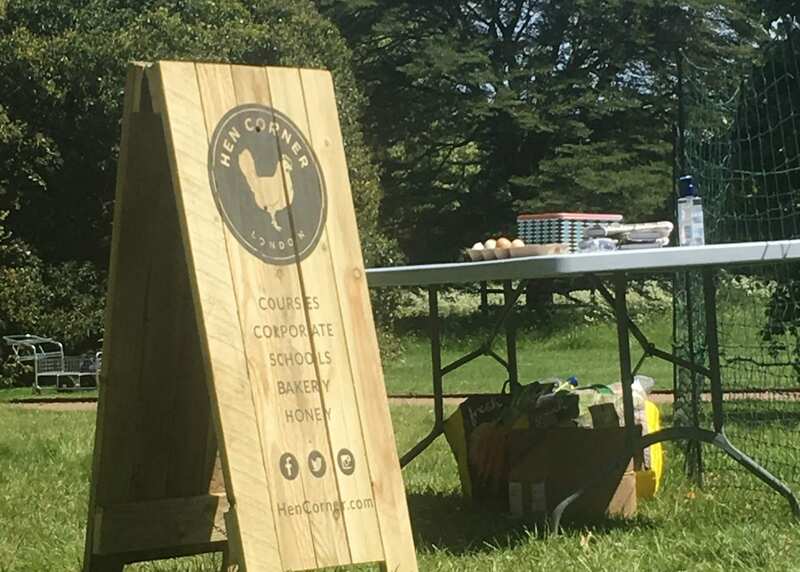 It’s great to work with the seasons at Hen Corner and we have a very special session coming up in August, Where Does My Food Come From? This is perfect for young families as we create a safe environment to gather food that has been grown, collect eggs, hug hens, meet the bees, taste their honey and sit on the lawn to eat the bounty of the garden. New jam jars have arrived especially for more Jelly off the Telly! What message would you want to pass on to the next generation about food and where it comes from?